The following official program (below at end) will show what is planned – – – when and where. We hope you will join us as we remember the immense importance of what took place in the small village of Columbus, New Mexico, one century ago. Sit back and relax as we entertain you with the exciting depiction of the history that unfolded here in those pioneering days of early aviation – right where it all took place! All about you will be re-enactors portraying the men and women who were here in this small border town one century ago. Some of these costumed participants (including some FASF members) will be hailing from as far away as the East coast. Take in the extravaganza of the huge and famous Mexican/American Cabalgata, where hundreds of riders and horses will converge on Columbus from deep in Mexico and from the United States. Most of the day’s events have been organized and promoted by active FASF members such as John Read, Chief Park Ranger for the Pancho Villa State Park, who has put together a fascinating and multifaceted program; while Norma Gomez, Director of the Columbus Chamber of Commerce and it’s President; Roberto Gutierrez, along with July McClure; local actress, musician, owner of the Tumbleweed Theater and Editor of the FASF Aerodrome Newsletter, have all worked tirelessly to assemble an exciting and highly instructive historical cavalcade of events from which both adults and children will learn a great deal. REMEMBER: THIS IS A ONCE-IN-A-LIFETIME EVENT! The FASF will kick off the big event at old Camp Furlong, now known as the Pancho Villa State Park. The FASF program will be opened by remarks from U. S. Congressman Steve Pearce, a former highly decorated U. S. Air Force pilot (in Vietnam), who will present an American Flag he had arranged to have flown over the U. S. Capitol on behalf of the First Aero Squadron Foundation to honor the 100th Anniversary of the birth of American Air Power. The Congressman will also describe a special Memorial Bill he has introduced to honor of the FAS. Next the Granddaughter of World War II’s famous General George S. Patton will say a few commemorative words about the event. The General was but a lowly Lieutenant when he was first chosen to be and Aide to General John J. “Black Jack” Pershing (above) here in Columbus during he Punitive Expedition. That was the very military campaign that witnessed the historic launching of American Air Power. As you may know, the Punitive Expedition out of Columbus was under the command of this great WWI American Leader. 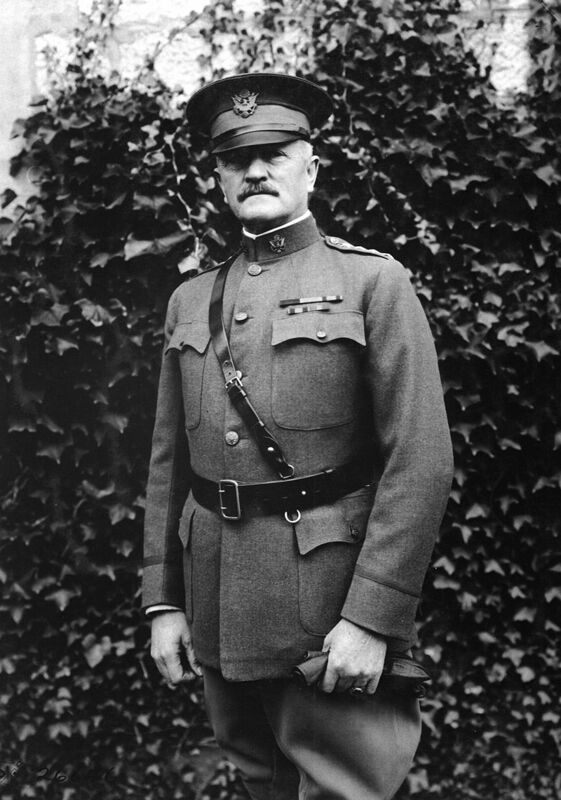 Pershing subsequently led all American Troops in Europe during WWI, just as did General Dwight Eisenhower during World War II. General George Patton’s (Right) granddaughter, Helen Patton (Left Below), an accomplished actress and vocalist, will present a memorial statement from Mrs. Sandra Pershing, the widow of General Pershing’s Grandson, Colonel John Pershing III, as a fitting launch for the day’s commemorative programs. Ms. Patton led similar commemorative events in France during the 70th anniversary of the WWII invasion of Europe two years ago. That French beachhead battle was the famous launching of the final campaign to defeat the Nazis, which took place on the bloody beaches of Normandy, France, on June 6, 1944. These ceremonial events, which Ms. Patton helped organize, were attended by most world leaders. Even Russia’s Vladimir Putin came to pay his respects. 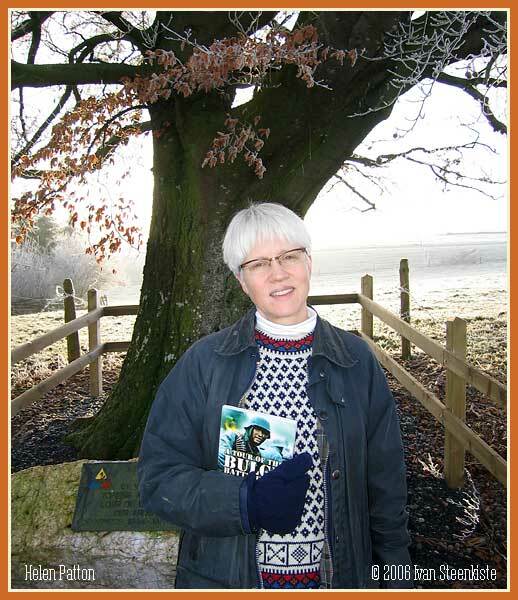 Helen Patton with Book about famous WWII Battle of the Bulge, which was led by her grandfather. Mrs. Patton (Left), a mother and housewife, as well as a performing artist, organized theater productions in Germany during the Bosnian conflict of the 1990s. She invited youths from rival ethnic groups to Germany to participate in an artistic workshop. That led to the creation of a German-based foundation called the Patton Stiftung Sustainable Trust. Later she also founded the independent U.S.-based Patton Foundation. The two organizations co-organized the 70th D-Day Memorial Concerts. Patton entitled the concerts: “The Patton Concerts: Liberation & Reconciliation for Every Generation,” which signaled the theme of “forgiveness and cultural understanding,” a theme she hoped to achieve through her love of art and music. Her grandfather’s charisma, course language, and famously inspiring leadership were memorably captured by George C. Scott in the 1970 multiple Academy Award winning film, “Patton,” including his famous, profanity-laden “Third Army speech” from 1944. 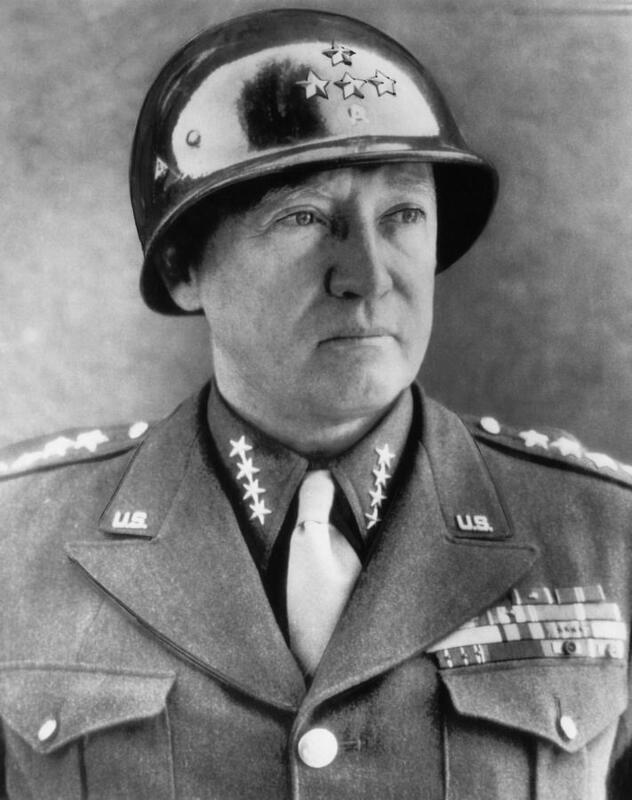 “Americans play to win all the time,” Patton told the U.S. 6th Armored Division. “The very thought of losing is hateful to Americans. Battle is the most significant competition in which a man can indulge. 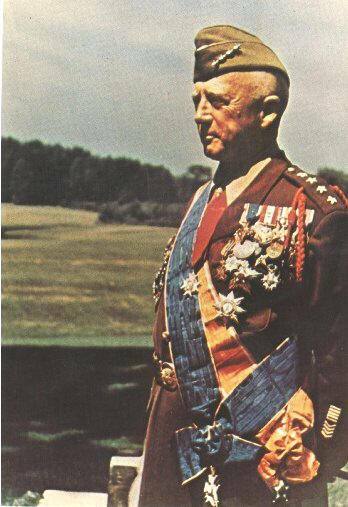 It brings out all that is best and it removes all that is base.” The General was a deeply spiritual man who believed fervently in the principle of reincarnation, which has been suggested as one of the likely reasons for his seemingly fearless behavior during the heat of battle. After Ms. Patton’s introduction at 10:00 AM, the Official First Aero Squadron’s film show will be presented along with a demonstration by the FASF 1916 Airfield Survey Team of Bill Madden, Fritz Wagoner, and Mark Drexler, showing the intensive forensic work they have done over the past three years to help plan the restoration of the historic airfield. We hope to see you at the upcoming events listed below this coming Saturday, March 12, 2016. In addition, if you are in or near Columbus on Wednesday, March 9th, the actual day of the infamous Villa raid in 1916, our sister historical organization, the Columbus Historical Society (“CHS”), is providing a Memorial Service at their widely known Depot Museum directly across the road to the East of the Pancho Villa State Park. Their program begins a 9:00 AM with the 1st Armored Division’s Brass Quintet and then actual memorial services led by local Village officials followed by a special commemorative speech by the CHS’s President, Richard Dean, the best known local expert on the history of what took place in Columbus a century ago. Mr. Dean’s great grandfather was one of those innocent civilians who lost their life to the Villista raiders. Also assisting at the CHS service will be Dr. Robert Bouilly, Historian at the U. S. Army Sergeant Major’s Academy at El Paso, Texas’ Fort Bliss. Dr. Bouilly is also an expert on all the events surrounding the now century old raid by Pancho Villa – and its aftermath, the Punitive Expedition. Please consider arriving early. Thousands of visitors are expected to invade Columbus this weekend. Seating in the Pancho Villa State Park 1916 Recreation Hall, where the FASF show will be presented, is limited, so it will probably fill up before the show begins. Don’t be left outside, when the door is closed – for lack of seating! This entry was posted in HOT NEWS! on March 7, 2016 by FASFRIC. Columbus on NM11. Parade of participants to end in the Park Plaza downtown. Entertainment throughout the day: Border Avenue Band’s Frank Gomez; Cantante de Musica Classica Luis Mario Baeza; Ballet Folkloricos Cielitos Director Lola Cisneros; Mariachi Encanto and Assoc. Charros de Emiliano Zapata; Grupo de Danza Korimi Director Dalila Gutierrez; July McClure, Dev Olliver, Bud & Jeane Canfield; Ballet Folklorico Fuego de Phoenix; El Paso performer Jorge Alberto Porras; Cielitos; Los Hermanos Flores: Alfredo y Andres; Korimi; Elders of the Four Directions of Southwest New Mexico Council. ALL DAY: Food vendors and more! Found out can do so, share on FB Timeline; by simply Copy-Pasting the address bar above of the article. So, to expedite matters; You could “Cheat” and do this to the fasf FB page Ric!